As soon as we started taking pictures on the grassy turf of the Glendale Town Square we were stopped by a nice security man named Jesus. This manicured “public” park is on city property located at the center of a new private development called Americana that combines a fancy outdoor mall with an upscale condo village – an idealized commercial version of a neighborhood, complete with private security to manage how people behave in public. But really the social environment managed itself. 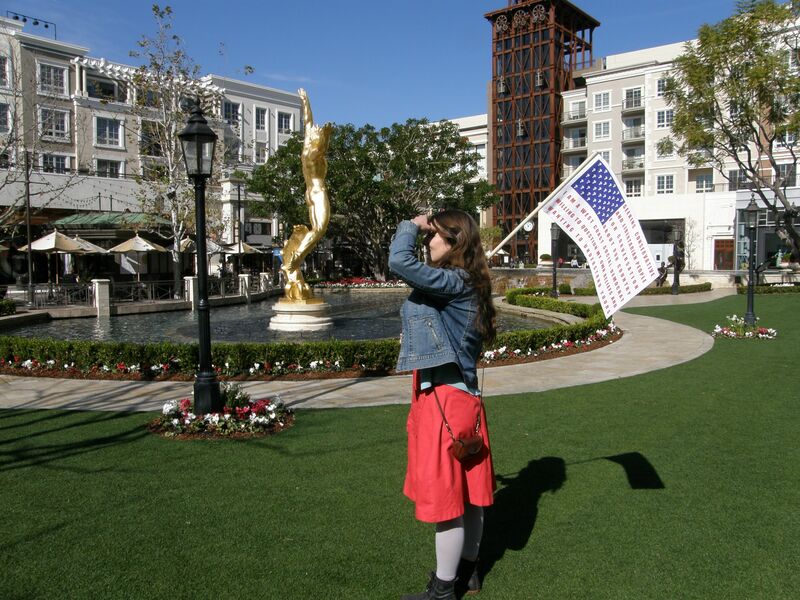 The people walking around the outdoor promenade either paid no attention to my flag or averted their eyes from me – more so than in any other place I have been. My friend Anna asked one couple sitting by the fountain whether they were conservative, and they replied that yes, they were, but they didn’t want to talk because they were relaxing. After that I went to the Beverly Hills sign, where I asked the first person I walked up to whether he was politically conservative and the man replied that, yes, he was as conservative as they come – so I asked him to tell me why. He was concerned about the US becoming a welfare state, like so many of the people I’ve talked with, so I asked him what he thought we should do to help poor people out of poverty if he didn’t want to give them government subsidies. He said we should get rid of the minimum wage and pay people as little as they would take. That way, in his view, business would be willing to hire more people and they would be able to compete better in a global economy, which would help the US economy in general and then more Americans would have jobs. I asked him what would happen if people took these jobs for such low wages only to be unable to afford to pay for their own costs of living. He replied that if people had jobs and they still were not able to support themselves then they could be given government support on top of their income to survive. If having a job was necessary to receive benefits there would be more of an incentive for people to work instead of just expecting benefits. He stated that every time the US has lowered taxes our government revenues have gone up instead of down, because businesses make more money and then pay larger sums of tax even though their rates are lower. He also brought up what I am learning is a standard conservative perspective on the great depression and the effectiveness of FDR’s make-work policies. He said that after ten years of FDR’s presidency the unemployment rate in the US was still at basically the same terrible level as when he took office, around 25%, and that the second world war actually was what pulled the US out of that recession not putting American’s back to work with government funds. He went on and on, with warm gusto. He explained how the housing collapse was the Democrat’s fault because they had supported policies that allowed banks to give loans to people without any proof that they had the means or the credit rating to pay them off. (* see note on housing collapse below) He said that it would be better if the US had continued to support the un-democratic leaders in Egypt and Libya. In his opinion that region has no history with democratic self governance and that their elections will become mechanisms for hard-line Islamist strong-men to take even more control. And he said more. After a long, spirited and friendly conversation I asked him what he was doing hanging out at the Beverly Hills sign. He said he was a pastor who had owned a chain of Christian bookstores on the East Coast but a few years ago he’d realized that bookstores were going under because of the internet and started looking for a new direction. He believes that god spoke to him and told him to go to Hollywood and minister to people. He thinks that the US is the biblical Babylon, exporting our cultural filth of pornographic movies and TV to the rest of the world and that this indicates that the end times are near. He hangs out in that park waiting for tourists to ask him to take their picture with the iconic sign and then that gives him a chance to talk with them and sometimes spread his mission. I had a good time talking with him but felt discouraged at the end. I have heard that both conservative economists and progressive economists claim that FDR’s depression economic stimulus policies prove their vision of how the economy works. If experts can make cases for both beliefs how can it be more than our biases that make us chose one political perspective or the other? I recognize I don’t know enough to argue with his description of how economics and politics work, and that is a problem. How expert do we need to be to analyze what is good for our country? While we were driving around Texas we ended up listening to Michael Savage, a conservative radio talk-show host, reiterating the argument that it was Democratic members of government, wanting to make housing loans available to everyone regardless of whether they were poor, or had bad credit, who had made two changes to mortgage law that then precipitated the housing collapse. The first of these legal changes, as conservatives tell it, was that Banks were told to stop “red-lining” certain areas as higher risk for loan default and the second change was that Banks were required to stop checking to see whether borrowers had proof of enough income to cover the mortgage payments they were taking on. This was exactly the argument made by the Pastor in Los Angeles, and it was also articulated by the fast and hard talking business man I spoke to later in Lubbock, TX. It was useful to me to hear a media source propagating this explanation, especially because it was being so faithfully repeated point by point by people all over the place.